Let's catch up with the 93-year-old man! Pictures and video clips of Tun Dr Mahathir Mohamad riding horses surface from time to time. As do video clips of him riding the tandem bicycle in and around Putrajaya, a city he built for working and living. At 93 years old, the prime minister has shown no sign that he will stop exercising. 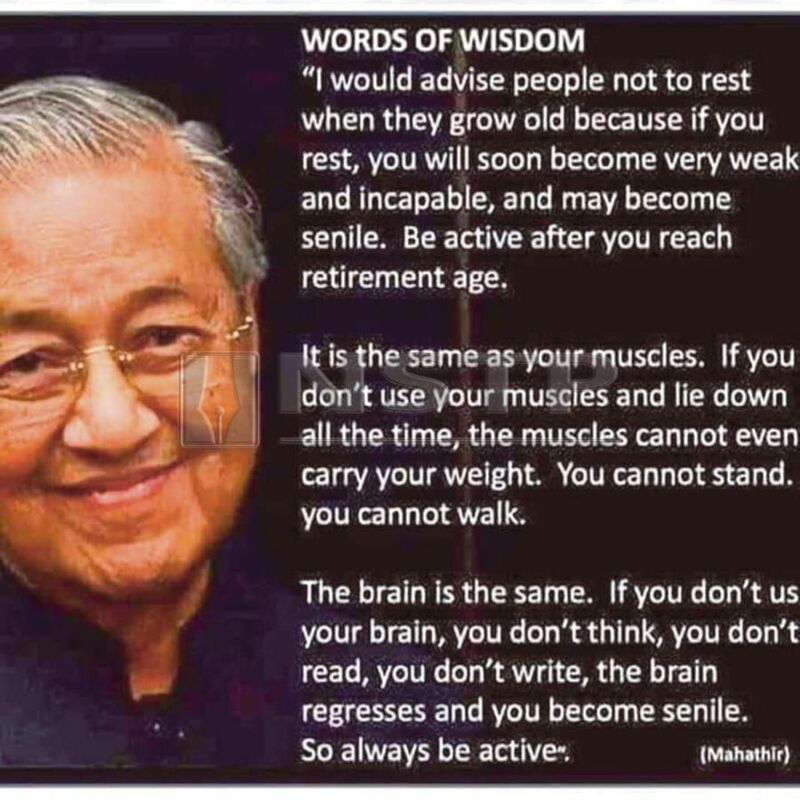 He has a simple advice for us mortals — when you are old, don’t rest; exercise regularly so that your muscles remain strong; exercise your brain by reading and writing. If you don’t, you turn senile fast. Enter Johan Karim, a 66-year old father of four. He didn’t plan to follow Dr Mahathir’s advice, but his exercise principle is close to that of the comeback prime minister. They have one other thing in common too — a grand wake-up call from doctors. A medical scare compelled Johan to turn from a couch potato into a fitness addict. As for Dr Mahathir, after his coronary bypass at the Kuala Lumpur Hospital in 1989, the prime minister started a serious exercise regime that saw him riding horses, cycling and brisk walking. Some of his horse-riding buddies tell stories of how skilful this Langkawi member of parliament is. He was way past 60 years old when he started horse riding, proving that one can do many things if one removes those mental blocks and get started. In Johan’s case, the German-trained shipbuilder turned entrepreneur had a somewhat similar beginning. Over tea, Johan gave his account: “The results of a routine medical examination were my defining moment. A sedentary life coupled with eating pattern required of my job as stakeholder relationship manager didn’t help my health. “Save for the occasional golf, further aggravated by the fact that going to work was literally driving from the home’s car porch to the parking lot at the office with minimal walking — that was it as far as physical activity was concerned. “A fatty liver, enzymes reading way above the band and basic lethargy was my medical profile. If unchecked, the consequences were not difficult to imagine. “Under the close supervision of Datuk Dr Ahmad Shukri of Putrajaya Hospital, we spent many months trying to manage the situation with stress test, medications and blood tests. But there was no significant improvement in sight. “One day the good doctor asked ‘Johan, are you taking any supplements?’ Yes, I am. Very often, as we age, we think we need supplements to get through the day. From Vitamin C to multivitamins, which we happily pop in the morning. “We decided to take a different approach. I put aside the supplements. I had orange juice for breakfast. And I started exercising. I got a personal trainer at a gym to help me do it right. The journey begins. Having a professional trainer is no laughing matter! You are akin to a masochist, and the trainer is a sadist. This further strengthened Johan’s resolve that a drastic change in lifestyle was called for. And it was then that divine intervention came to take Johan to the next level. He went on: “Luck was on my side. My son, 14 then, and daughter, 12, were in a Triathlon Club and it’s a requirement that parents must accompany their children on the cycling portion. “Coincidentally, I also had golfing buddies who were going through golf fatigue. We then decided to form a cycling group. In the spirit of Forrest Gump, we cycled and cycled and cycled. “We rode over hills and valleys and on straight roads, prodded by our coach. We are now in our third year. Weekend training consists of a variation of 42km Ulu Langat to Sg Tekala hill ride; Lekas 50km endurance rides; Putrajaya-Cyberjaya 40km and other routes. “Today, as we speak, we are all looking forward to our fellowship ride in Langkawi in about two weeks’ time. For me at least, this physical routine is likely going to be my roadmap for the coming years. “I’ve been taking part in numerous cycling competitions in the last couple of years. The OCBC Cycle 2018; M3X Putra Perdana Duathlon (5km run, 30km cycling, 5km run); The Powerman Asia Series, and the Lekas Night Ride — to name a few. “Apart from cycling, I run, trek and scuba dive. In November last year, I trekked the Annapurna Base Camp in Nepal, participated in run events starting from 5km, moved up to 10km and have completed 15km. “Five years ago, I would never think that this was possible. My weekly exercise routine consists of alternate mornings of 5km run; freestyle swimming and weekends rides of between 40km and 60km. “My advice to anyone above 60 years old — just start and don’t be distracted by people who say things like running is bad for the knees, cycling will make you impotent (at 60 plus, does it matter? ), your heart can’t take it and many more concerned remarks. “I believe I am fit for a 66-year-old; take no supplements; have an average BP of 120/70 with a resting heart rate of below 50 bpm. exercising and getting fit? Tired? No time? Busy? Don’t know where to start? Accept it — we are just plain lazy. Let’s move on! Let’s catch up with the 93-year-old man!